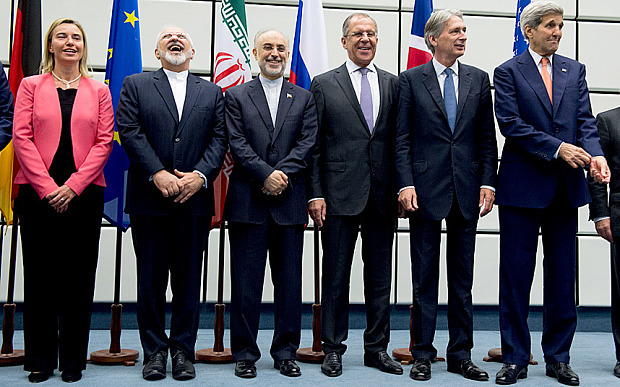 This weekend marked one year since the nuclear agreement with the Iranian regime – known as the Joint Comprehensive Plan of Action – was reached between Iran and the group of nations known as the P5+1 and subsequently adopted by the United Nations Security Council and European Union. The Iran lobby made it a life or death struggle between forces of good and moderation versus dark and hardliners. The Iran lobby promised a new era of rising moderate political influence and an opening to the West. The Iran lobby warned that failure to approve the agreement would plunge the region into chaos and open the door for decades of unremitting violence and turmoil. The Iran lobby promised that failure to approve a deal would lead to a cataclysmic war with Iran that could unleash nuclear weapons. It warned of a war-mongering hunger within the U.S. government intent on eradicating the poor, peaceful mullahs. “War against Iran has been on the agenda in Washington since at least 2005. The 2007 National Intelligence Estimate is credited with thwarting the George W. Bush administration’s plans — confirmed to me by administration officials — to attack Iran by revealing that the U.S. intelligence community had concluded that Iran did not have an active nuclear weapons program,” wrote Trita Parsi of the National Iranian American Council last June 2015 in Foreign Policy. His warnings were part of the “good cop, bad cop” playbook the Iran lobby used in praising Iran’s intentions and denouncing the threat of war from those opposed to the deal. Unfortunately for the rest of the world, they were spectacularly wrong in their promises and warnings. One year later the Middle East is in chaos with three full blown wars raging across Syria, Iraq and Yemen, causing the largest refugee crisis the world has seen since Adolf Hitler went goose-steeping across Europe. Yousef al-Otaiba, the ambassador of the United Arab Emirates to the U.S., wrote in this weekend’s Wall Street Journal of the uncertainty and angst being felt throughout the region with a newly empowered and aggressive Iranian regime since the nuclear deal. “Since the nuclear deal, however, Iran has only doubled down on its posturing and provocations. 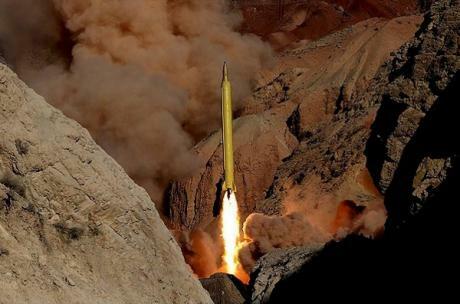 In October, November and again in early March, Iran conducted ballistic-missile tests in violation of United Nations Security Council resolutions. “In December, Iran fired rockets dangerously close to a U.S. aircraft carrier in the Strait of Hormuz, just weeks before it detained a group of American sailors. In February, Iranian Defense Minister Hossein Dehghan visited Moscow for talks to purchase more than $8 billion in Russian fighter jets, planes and helicopters. “In Yemen, where peace talks now hold some real promise, Iran’s disruptive interference only grows worse. Last week, the French navy seized a large cache of weapons on its way from Iran to support the Houthis in their rebellion against the U.N.-backed legitimate Yemeni government. In late February, the Australian navy intercepted a ship off the coast of Oman with thousands of AK-47s and rocket-propelled grenades. And last month, a senior Iranian military official said Tehran was ready to send military ‘advisers’ to assist the Houthis,” Otaiba writes. The laundry list of militant acts by the Iranian regime grows longer each day to include smuggling warheads and arms to Shiite cells in Bahrain and Saudi Arabia, widespread crackdowns at home aimed at political dissidents and religious minorities, large-scale human rights violations including historic levels of executions of women and children, and rigging of parliamentary elections to remove over half of the candidates from even appearing on the ballot, including the most loyal agents and officials of the same regime in the past few decades. The swiftness of the transformation of the Iranian regime since the nuclear deal was approved last year has been stunning. The mullahs are flush with cash, they’ve invited foreign companies to invest billions, not suffered any repercussions from human rights violations or involvement in proxy wars, kept their nuclear enrichment infrastructure intact and elevated development of their ballistic missiles to reach Europe, Africa and American military bases from the Indian Ocean to the Mediterranean. And the regime has no intentions of taking its foot off the gas, especially in the area of boosting its missile capability. Ali Larijani, the regime’s parliamentary speaker and someone lauded by the Iran lobby as a “born-again moderate” said that Iran should continue to develop its missile capabilities despite opposition from western countries. “Although some excuses recently raised by a number of Western countries about Iran’s missile [tests] are flimsy and legally worthless, they are indicative of their long-term policy which [shows] that they do not want the Islamic Republic to be powerful enough to ensure regional security,” he said according to Tasnim News on Saturday. There is a certain irony that last year the world was worried about nuclear warheads and now it has to worry about missiles to carry those warheads and battlefields across the region, as well as a sharp rise in terror attacks striking at cities around the world killing hundreds. The ultimate irony came in President Obama’s remarks at the so-called National Security Summit this weekend in Washington in which he criticized the regime for undermining the “spirit” of the agreement even as they stick to the “letter” of the deal. “Iran so far has followed the letter of the agreement, but the spirit of the agreement involves Iran also sending signals to the world community and businesses that it is not going to be engaging in a range of provocative actions that are going to scare businesses off,” Obama said at a press conference. I can’t tell if the president is naïve or just-plain dumb when he equates a burgeoning missile program and threat of nuclear annihilation to a need to improve Iran’s business climate. The problem the world is dealing with in Iran is not that businesses are skittish of investing, but rather that the mullahs are intent on remaking the world in their own image. We can only hope that come November, a new administration will be more intent on reigning in Iranian extremism rather than the opening of a new McDonalds or Starbucks in Tehran. In a speech that reinforced the fact that he alone was firmly in control of the Iranian regime’s military policies, top mullah Ali Khamenei firmly defended the regime’s ballistic missile program in the face of mounting concerns around the world as missile after missile has been launched. 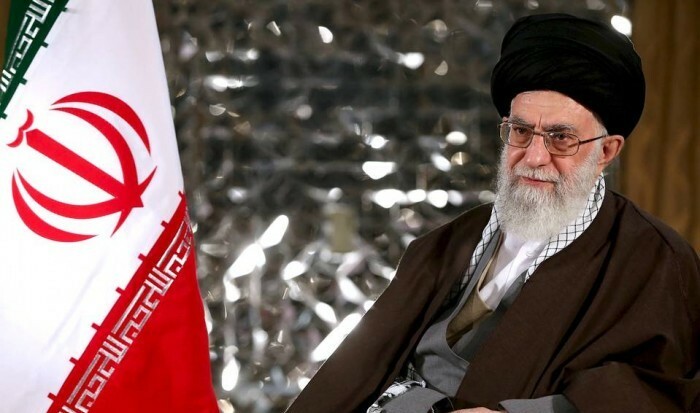 In a speech on Wednesday, Khamenei said that Tehran would lose its leverage in negotiations with the world’s major powers if it were to abandon its missile program. It’s a curious point to make since Iran currently possesses the largest military in the region, and now flushed with over $100 billion in cash from the nuclear agreement, has gone on a furious buying binge of new advanced military hardware including tactical fighters, anti-aircraft and anti-ship missile batteries, tanks and encrypted communications equipment. The regime also exerts influence and power through its network of terror groups and proxies such as Hezbollah, Shiite militias and the Houthis in maintaining control. The argument of needing intercontinental ballistic missiles for defense is farcical since such weapons are commonly characterized as first-strike offensive weapons. United Nations Security Council Resolution 2231 expressly restricts the regime from developing such weapons and Khamenei has openly dismissed such restrictions as being inapplicable to Iran. Khamenei was speaking to religious eulogists in Tehran a day after it emerged that the US and its European allies in the security council had written a joint letter warning that recent missile tests by Iran were in defiance of a UN security council resolution adopting last year’s nuclear agreement. The letter, which claimed that Iranian missiles were “inherently capable of delivering nuclear weapons”, was carefully drafted and did not say, however, that the tests violated the accord itself, which would have serious implications on its implementation. His speech was aimed not only at international audiences, but also to domestic ones in which he sought to tamp down any expectations of hope for moderation or change in the regime’s leadership. Even at age 76, Khamenei remains engaged and committed to the extremist principles it espouses. The furor over how to rein in the regime’s missile program is an ironic repeat of the same consternation and debate that enveloped the regime over its nuclear program three years ago. While Groundhog Day already came, it still seems like the cycle of Iranian violations and threats of new sanctions is repeating itself. This also points out the inherent weakness of the Iran lobby’s argument last year in which groups such as the National Iranian American Council argued strenuously to remove subjects such as the ballistic missile program from nuclear negotiations in the false hope it would lead to moderation. The opposite has occurred now that the regime, led by Khamenei, feels it has the upper hand in pushing forward with its military programs without worry of repercussions or penalties. But if signs that the United Nations Security Council might not sanction Iran over its ballistic missile program continue, a key member of Congress vowed an angry response, potentially increasing the incentives for lawmakers to come down hard on Tehran with congressional sanctions. The Treasury Department has taken steps to sanction Iran over the reported ballistic missile tests, blacklisting individuals and companies that it determined are working to support Iran’s ballistic missile program. There is strong bipartisan support for coming down hard on Iran for the missile tests as well, with several Democrats who supported the Iran deal arguing it is essential to the integrity of that deal to make sure Iran is held to account for its actions elsewhere. Sens. Corker and Ben Cardin (D-Md. ), are expected to soon release bipartisan legislation stepping up sanctions against Iran over its ballistic missile program. The flurry of action shows the price to be paid for previous inaction in opposing the regime. Sooner or later, the world will have to come to the realization that appeasing the mullahs only emboldens them. You have to wonder just how much of North Korea is rubbing off on the mullahs in Tehran as the Iranian regime launched ballistic missiles for the second straight day in violation of United Nations Security Council resolutions and boldly thumbed their collective noses at the U.S. as Vice President Joseph R. Biden Jr. was touring Israel. The Revolutionary Guards Corps, which oversees the Islamic state’s missile program, fired two missiles that it said hit targets over 850 miles away and pointedly declared that Israel was now within striking distance. If they didn’t get their point across, the IRGC said the missiles bore inscriptions written in Hebrew on the side saying “Israel must be wiped off the face of the earth,” as reported by Fars, a regime news agency which also released video of the launches. As expected, the Iran lobby did not utter one tweet, statement or editorial condemning the provocative launches, nor the timing which seemed designed to send a pointed message to the U.S. The repeated launches does bring to mind the tactics used by North Korea in also aggressively firing missiles and rockets regardless of any international sanctions that exist. The fact that the two radical nations – which already share missile and nuclear technology – are now sharing the same political playbook should come as no surprise. The lack of inclusion of the regime’s missile program in the nuclear agreement reached last year shows the glaring loopholes that exist for Iran to continue the development of destabilizing weapons systems that can deliver chemical, biological or conventional warheads – let alone nuclear ones developed in secret – anywhere in the Middle East and most of Europe, Asia and Africa. The lack of response from the Obama administration was predictable and disheartening for those who have consistently warned of the threat the regime poses; even after a rigged parliamentary election was touted as producing a “moderate” shift in Iran’s domestic politics. Laudably, Democratic presidential candidate Hillary Clinton entered the fray by calling for more sanctions against the Iranian regime in light of this most recent violation. Clinton said on Wednesday she was “deeply concerned” by reports that Iran had tested multiple ballistic missiles and said the country should face sanctions for its actions. 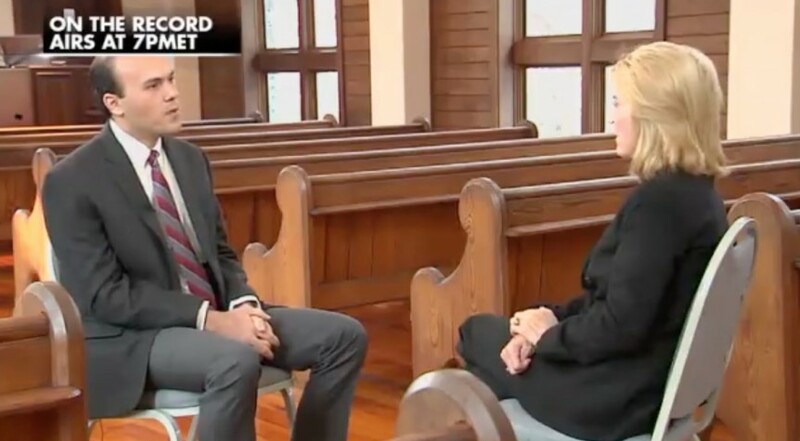 “This demonstrates once again why we need to address Iran’s destabilizing activities across the region, while vigorously enforcing the nuclear deal,” Clinton said in a statement. “Iran should face sanctions for these activities and the international community must demonstrate that Iran’s threats toward Israel will not be tolerated,” she said. Her backing of sanctions comes as Democrats and Republicans on Capitol Hill joined together in a push to develop new sanctions against Iran in light of these new and repeated transgressions. Senate Foreign Relations Committee Chair Bob Corker (R-Tenn.) and ranking member Ben Cardin (D-Md.) are preparing legislation to slap additional sanctions on Iran in response to a recent spate of ballistic missile launches. While the tests do not themselves violate the Iranian nuclear deal that took effect in January, officials believe they fly in the face of other international prohibitions and weaken the spirit of compliance needed to sustain the nuclear pact. The senators are also negotiating a way to extend the current regime of sanctions under the Iran Sanctions Act past the end of the year, and possibly increase sanctions against Tehran for other conventional weapons and terrorist activities as well. If the Senate can produce a package of sanctions, it stands a good chance of getting an audience in the House, where Speaker Paul Ryan (R-Wisc.) said Tuesday that Congress would “continue to press for new sanctions against Tehran” in light of the most recent ballistic missile tests. The realization that the Iranian regime remains committed to a militarized pathway in the wake of the nuclear deal and recent elections was not lost on U.S. military commanders, as the top U.S. military commander overseeing the Middle East said Tuesday that despite the nuclear deal, Iran shows no signs of altering its destabilizing behavior. “There are a number of things that lead me to personally believe that, you know, their behavior is not — they haven’t changed any course yet,” said Army Gen. Lloyd Austin, commander of U.S. Central Command, at a Senate hearing. Austin said he was concerned about Iran’s continued testing of ballistic missiles, which the U.S. intelligence community believes is Iran’s preferred method for delivering a nuclear weapon. “What I would say is that what we and the people in the region are concerned about is that they already have overmatch with the numbers of ballistic missiles,” Austin told the Senate Armed Services Committee. Austin also expressed concern about an “emerging strategic partnership” between another U.S. adversary, Russia. The two nations are working together to bolster Syrian President Bashar Assad’s government. “What I worry about is [if] that relationship between Syria, Russia and Iran develops further, that it will present a problem for the region,” he said. That cooperation is expanding to include the sale of high-end weapons, Austin said. “We’ve seen recently [the sale of] high-end air defense capability from Russia to Iran and that’s a problem for everyone in the region,” Austin said. All in all, it hasn’t been a very good weak for the Iran lobby proponents of a new moderate Iran and puts to a lie what they have been advocating for so long. While the Iran lobby argued strenuously that a nuclear deal with the Iranian regime would facilitate a moderation in its outlook, it also suggested that the financial windfall coming from the release of sanctions would help bolster the Iranian economy, benefitting the Iranian people and helping turn the Islamic state into an economic engine in the region. Regime advocates such as the National Iranian American Council (NIAC) and The Ploughshares Fund were outspoken in their conviction that ultimately the Iranian people – hurt after years of international sanctions – would be the ones lifted up by the rising tide of new capital flooding into the country. Predictably those claims have turned out to be just another in the truckloads of false promises made by the Iran lobby. The reality has been harsh and unforgiving. In the months following completion of the deal, the regime has turned all of its attention to just two issues: the crackdown on dissidents at home in advance of parliamentary elections and upgrading as quickly as possible its military forces. This was evidenced on Hassan Rouhani’s recent European tour in which he signed a flurry of business deals with foreign companies aimed at rebuilding the country’s infrastructure and funnel billions of dollars toward companies controlled by the Islamic Revolutionary Guards Corps (IRGC). It is no surprise that the IRGC is the first institution in Iran to benefit from the largess. Rouhani’s government made the decision to keep the bulk of the $100 billion in their overseas accounts in order to pay for foreign military purchases in euros or dollars and they have wasted no time buying. 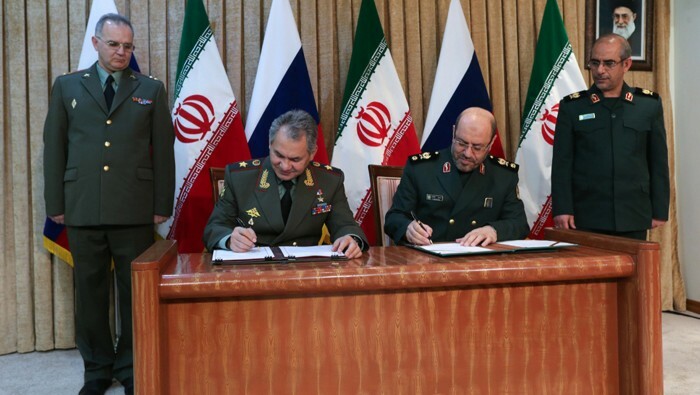 The first deal to be completed was the sale of S-300 anti-aircraft missile batteries that are a significant upgrade to the regime’s defenses and could be used to protect any nuclear facilities the regime chose to restart. In addition, the regime announced another round of purchases of Russian arms totaling $8 billion. According to news reports, Iran wants to purchase more sophisticated anti-aircraft missile systems and also a new cadre of warplanes. The new deals will be in addition to several outstanding arms and military contracts that have already been signed between Iran and Russia. A Russian source who spoke to the media said Iran is also interested in the latest anti-aircraft technology. Iran also is seeking to buy and possibly license for domestic production Russia’s new Sukhoi Su-30SM fighter jet, which is used for air-to-air and air-to-surface combat. “Iran is also interested in Russia’s Bastion mobile coastal defense missile system, equipped with supersonic Yakhont anti-ship missiles, along with Mi-8/17 helicopters and other arms,” according to the regime-controlled media. The military purchases represent one of the largest investments in state-of-the-art military hardware anywhere in the Middle East. The addition of supersonic fighter jets, anti-ship missiles and even more sophisticated anti-aircraft systems poses a grave threat to international shipping lanes through the Strait of Hormuz. News reports also indicated the regime would seek to diversify its military suppliers by seeking arms purchases from China as it dips heavily into its newfound wealth. The rapid buying binge indicates the mullahs’ strong desire to rearm Iran into the region’s most powerful military. To give the expenditures perspective, the entire publicly reported budget for the Iranian regime’s military was $10.2 billion, supporting over half a million active duty regime personnel. The Russian agreement nearly equaled the entire budget last year and more buying is on the way. The inevitable question that needs to be asked of the Iran lobby is where is the money to help the Iranian people? Little of the money has been brought back to Iran and even less has been disbursed to help ordinary Iranians with healthcare, education, or even food. Why does the Iran lobby ignore all these actions? Probably the same reason it is ignoring the carnage in Syria being wrought by the Iranian regime as well. In fact, the civil war in Syria is at the heart of the Iranian regime military buildup and an example of why the regime cannot be trusted. As the Independent newspaper detailed the obvious contradiction in supporting a nuclear deal that only served to supply the regime with fresh resources to wage an even bloodier war in support of keeping Syrian dictator Bashar al-Assad in power. “The Geneva III peace process is the most immediate cause for this latest offensive against Aleppo, led on the ground by Iran’s Islamic Revolutionary Guard Corps (IRGC) and its proxies, as well as Russian airstrikes. The regime and Russia have used it as a cover to gain ground. The US took the process seriously so sought to de-escalate, taking steps to weaken its own side. This included restricting the rebels’ access to anti-tank missiles”. “Russia, on the other hand, enabled the IRGC-run forces that control the Bashar al-Assad regime’s security sector to cut the rebels’ final Aleppo supply line into Turkey and move to impose a starvation-siege on the city like the ones they have imposed on forty-nine other areas in Syria. The regime coalition can then either bring the city to its knees and complete the reconquest, or quarantine the rebels in the city, freeing up resources to deploy against rebels on other fronts,” he added. The Iranian regime’s intentions in Syria are simple: 1) Keep Assad in power; and 2) Do it anyway it can. “Assad, Iran, and Russia have worked tirelessly to eliminate the moderate opposition so that there will be nobody for the international community to interface with, and Assad’s reign will have to be accepted—and perhaps even supported to reconquer the Isis-held areas in the east,” Orton said. The brutal evidence of that ruthless strategy can be seen in the deliberate targeting of civilians and the use of barrel bombs and now starvation as a tactic to weaken the opposition. The mullahs are well acquainted with using death, destruction and executions as a tactic for winning its conflicts. The diplomacy the Iran lobby publicizes with great fanfare cannot be found on the battlefields of Syria, Yemen or Iraq where the Iranian regime’s policies are killing tens of thousands. In an appearance before the Senate Armed Services Committee on Tuesday, James Clapper, director of national intelligence, gave a very somber description of what he sees as the Iranian regime’s intentions toward the U.S. now that last summer’s nuclear deal has commenced. In particular, his statements offered little assurance the regime is acting as an honest actor with the U.S. and the other states involved in last year’s negotiations, or that the nuclear deal will stop Iran regime from obtaining a nuclear weapon. “Iran probably views JCPOA [Iran deal] as a means to remove sanctions while preserving nuclear capabilities, as well as the option to eventually expand its nuclear infrastructure,” said Clapper. The U.S. intelligence community has concluded that “Iran does not face any insurmountable technical barriers to producing a nuclear weapon, making Iran’s political will the central issue,” according to Clapper. Clapper’s statements stand in stark contrast with those made by the Iran lobby led by the National Iranian American Council, which lauded the nuclear accord last summer, claiming it would not only stop all of Iran’s possible pathways to a nuclear weapon, but that “under its terms, Iran is never allowed to build a nuclear weapon.”When queried on Iran’s missile tests conducted in October and December of 2015 just months after the signing of the Iran deal, Clapper had no doubts the regime was trying to send a message. “I think this was a deliberate message of defiance and that the Iranians are going to continue with an aggressive program to develop their missile force,” said Clapper. The regime also continues research on its space program, which is largely considered a front for the construction of advanced ballistic missile technology. 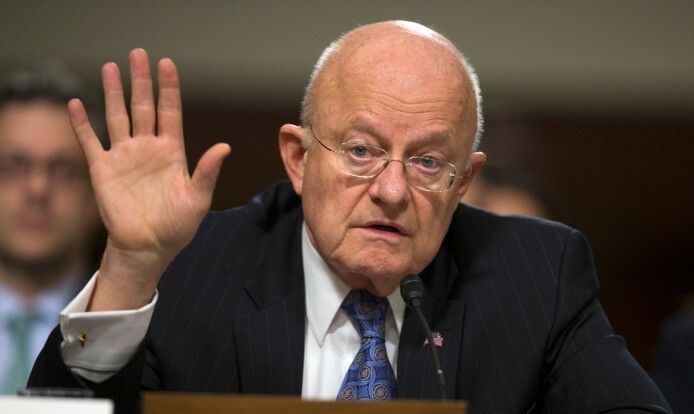 “Iran’s progress on space launch vehicles—along with its desire to deter the United States and its allies—provides Tehran with the means and motivation to develop longer-range missiles, including ICBMs,” Clapper said. At the same time, Iran continues to be the world’s foremost sponsor of terrorism. “Iran—the foremost state sponsor of terrorism—continues to exert its influence in regional crises in the Middle East through the Islamic Revolutionary Guard Corps—Quds Force (IRGC-QF), its terrorist partner Lebanese Hezbollah, and proxy groups,” Clapper said. The Obama administration responded to the tests with a new round of sanctions on Iran’s missile program. Regime officials said the new sanctions would not deter its ambitious missile program, and that it will instead go on the “offensive” in response. It is in this context that the recent ramp up in testing and deployment of new ballistic missiles and nuclear warheads by North Korea is the most troubling since it has been North Korea that has provided the initial designs and materials to the Iranian regime for its nuclear and missile programs as Clapper indicated in his testimony. He testified that North Korea has expanded its Yongbyon plant for uranium enrichment and has restarted a plutonium reactor shut down in 2007 that could produce nuclear weapons fuel “within a matter of weeks to months.” North Korea could have as many as 100 nuclear bombs less than five years from now, plus, as Clapper warned, it’s developing an ICBM missile to carry them to the U.S. homeland. North Korea in many ways is the preview of what the Iranian regime is on track to similarly do as it has broken all of the agreements it has made, developed its weapons program under the unsuspecting eyes of international inspections and freely traded in its technology to other radical nations. North Korea is also a reminder that hollow diplomatic promises not backed up by severe consequences leads to only more appeasement in a desperate bid to regain perceived momentum with each new violation and militant act. It’s a pattern that is already being repeated with the Iranian regime which has launched new missiles, stepped up its wars in Syria and Yemen and instituted a large-scale crackdown on human rights and political dissidents at home in advance of upcoming elections. And even with the Iran lobby’s own, most vocal supporters being similarly tossed into Iranian prisons, the Iran lobby cannot face the awful consequences of its actions and still expresses support for the totalitarian regime in Tehran. That link between North Korea and the Iranian regime is under scrutiny by members of Congress who have called for an investigation of the cooperation between the two regimes. Sen. David Perdue (R-Ga.) late Monday filed an amendment to a North Korea sanctions bill that would require the administration to disclose to Congress any cooperation between the rogue Asian nation and Iran on nuclear weapon and ballistic missile development. Congress took up the issue after North Korea said it successfully tested a hydrogen bomb last month. On Saturday, the country conducted a missile launch that it claimed was to put a satellite into space for peaceful purposes, but the U.S. and allies suspect was a long-range missile test in violation of international law. Perdue and other members of Congress suspect that North Korea and Iran are cooperating and that the administration has been reluctant to disclose to Congress what it knows. “It’s undeniable that Iran and North Korea have been cooperating on nuclear weapon and ballistic missile development for years now,” said Perdue, a member of the Senate Foreign Relations Committee, in a statement. “Iranians have reportedly been present for at least three of North Korea’s nuclear tests,” he said. Perdue’s amendment would require the administration to submit a semiannual report to Congress on North Korea’s cooperation with Iran on nuclear weapon and ballistic missile testing, development and research. It would also require the administration to disclose to Congress the identity of individuals who have knowingly engaged in or directed material support or exchanged information between governments of Iran and North Korea for their nuclear programs. “This amendment forces the Obama administration to disclose to Congress what it knows about this cooperation between rogue nations, instead of denying the linkages. The sooner we acknowledge this illicit cooperation, the sooner we can work to put it to a halt,” Perdue said. The failure to rein in North Korea and the appeasement of the mullahs in Iran with a deeply flawed nuclear deal has only emboldened these regimes to aggressively move forward with their plans. We can only hope that the world will respond soon enough to halt these threats before it’s too late. While most of the U.S. and a good chunk of the global sports audience watched the Denver Broncos defeat the Carolina Panthers in Super Bowl 50 on Sunday, the rest of the world continued to struggle with the daily hardships that have come with the rise of Islamic extremism flowing out of the Iranian regime. That extremism has come to take many forms including the world’s largest refugee crisis since World War II as Syrians flee the civil war that Iranian forces have exacerbated. It has also resulted in rising tensions with the Iranian regime since the completion of a nuclear deal that was sold as being an instrument for moderation by the Iran lobby – most notably the National Iranian American Council. Those tensions have included the blatant violation of existing United Nations Security Council sanctions banning the development of nuclear-capable ballistic missiles and the continued crackdown on Iranians in advance of upcoming parliamentary elections, including the imprisonment of Iranian-Americans, Christians, dissidents, journalists, artists, bloggers and scores of others deemed a danger to the ruling mullahs. “Various elements in Iran remain hostile to the United States. Since the United States and Iran reached a Joint Comprehensive Plan of Action to address the international community’s concerns over Iran’s nuclear program on July 14, 2015, Iran has continued to harass, arrest, and detain U.S. citizens, in particular dual national,” read the State Department warning. “The Iranian government continues to repress some minority religious and ethnic groups, including Christians, Baha’i, Arabs, Kurds, Azeris, and others. Consequently, some areas within the country where these minorities reside, including the Baluchistan border area near Pakistan and Afghanistan, the Kurdish northwest of the country, and areas near the Iraqi border, remain unsafe. Iranian authorities have detained and harassed U.S. citizens, particularly those of Iranian origin. Former Muslims who have converted to other religions, religious activists, and persons who encourage Muslims to convert are subject to arrest and prosecution,” added the statement. Naturally the Iran lobby is completely silent on this issue since there is really nothing it can say to defend the Iranian regime, unless of course it did a public service by reprinting the State Department warning on their own websites to provide a heads up to Iranian-Americans. The only public pronouncements the Iran lobby has made on travel is to condemn the notion of requiring background checks on those wishing to secure a visa to travel to the U.S. from nations such as Iran. The plight of those with dual citizenship being detained and imprisoned in Iran was made more public when Reuters confirmed that a number of these dual citizens were being charged with espionage similar to what Washington Post reporter Rezaian was charged. The fact that the mullahs still view the holding of dual citizens as a form of political gamesmanship and bartering leaves little room for the Iran lobby to make any case for a new wave of “moderation” sweeping over the Iranian regime. In an odd twist, Siamak Namazi, an Iranian-American with strong ties to the Iran lobby and others supportive of the regime and the nuclear deal, was arrested and is still being held in Iran. Namazi’s friends and supporters, including the NIAC, have attempted to portray his plight as being a pawn in the political power struggle between so-called “moderate” and “hardline” factions within the Iranian regime, but the simple truth may be he is just another bargaining chip the regime may want to use in the future. But his arrest does send a clear signal to the Iran lobby that their utility to the regime is only as worthwhile as the mullahs deem fit and they – like any other Iranian – could just as quickly and easily find themselves in Evin Prison even after being a loyal supporter of the regime. That nefarious nature of the regime was reinforced by disclosures that even as the Iranian regime was working to negotiate a nuclear deal, it was working to hide its atomic work at its Parchin military complex which has been used to test high explosives necessary for ignitors for nuclear warheads according to various intelligence agencies and Iranian dissident groups. 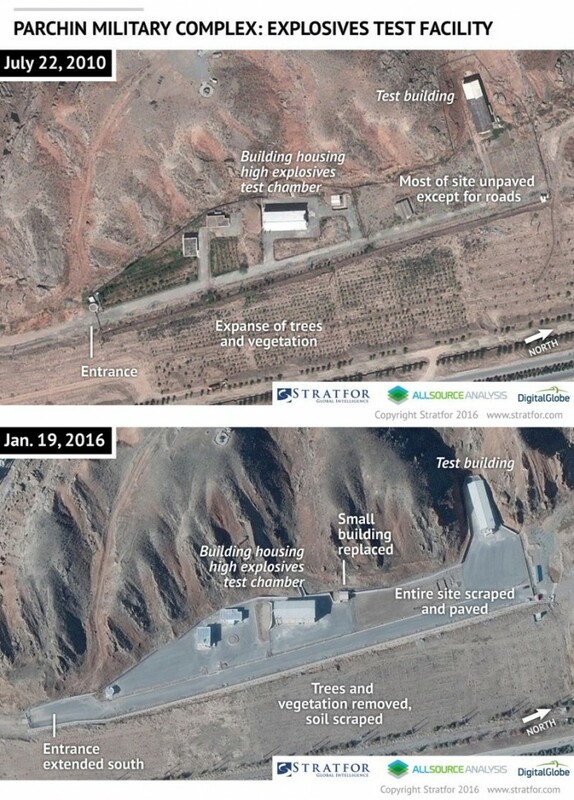 Forecasting site Stratfor.com says the images published Monday show Iran building a tunnel into a heavily guarded mountain complex inside the Parchin facility, some 20 miles southeast of Tehran, while also working to erase signs of alleged high-explosive testing at another area on the site. “We’re not saying they’re cheating on the nuclear deal,” Stratfor analyst Sim Tack told The Daily Beast. “The images show Iran was going through the motions to hide what it’s done before, and it is still…developing facilities that the IAEA may or may not have access to,” Tack said, referring to the International Atomic Energy Agency. The progression of satellite images tracking construction at Parchin from 2012 to 2015 show how Iran’s leaders apparently worked to keep regime hardliners happy by moving forward with weapons programs, even as the leadership worked to erase signs of an illegal nuclear weapons program, Tack said. The imagery reveals new paving around a building alleged to be used for high-explosive testing, while another shows plants and trees removed and soil scraped and hauled away as possible evidence of radioactive contamination was removed in advance of inspections. The simultaneous construction of a tunnel entrance into the mountain complex is also worrisome since the regime has since released new photos showing its inventory of ballistic missiles stored in new underground bunkers. Yet even with all of these acts and revelations, the Iran lobby remains silent. We can only assume it has been waiting for the Super Bowl so they can relax while their fellow Iranian citizens undergo more torture. The Iran lobby, led by the squawking voices of luminaries such as Trita Parsi and Reza Marashi of the National Iranian American Council and so-called journalists Jim Lobe and Ali Gharib, promised a new moderate Iran after the nuclear deal was announced, which was met with loud demonstrations and honking car horns on the streets of Tehran by Iranians hoping for a new shift in the regime’s policies moving forward. 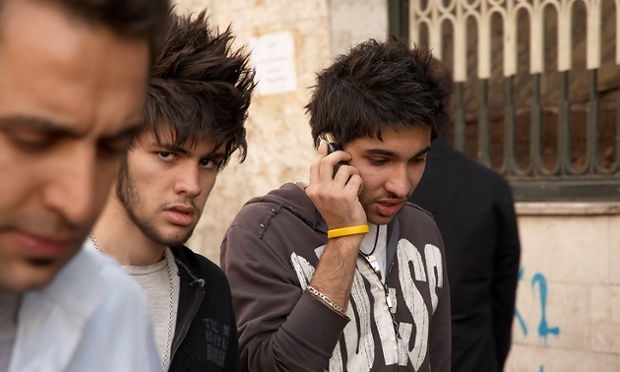 That hope has slowly been strangled and has led to widespread disillusionment among ordinary Iranians, especially Iranian youth who face appalling high unemployment rates, are subjected to internet cyberwalls and live in constant fear of arrest and torture for engaging in counter-revolutionary acts such as posting photos on Instagram. Their hopes had been bolstered by the false promise offered by the election of Hassan Rouhani, who has become the false face of a regime which has no intention of changing course. Reuters took a deeper look at the dissatisfaction running through Iranian society and the lack of progress towards the moderate promises made by Rouhani’s ascension. Rouhani won the presidency in 2013, bolstered by the support of many women and young people who were encouraged by his comments that Iranians deserved to live in free country and have the rights enjoyed by other people around the world, said Reuters. But rights campaigners say there have been little, if any, moves to bring about greater political and cultural freedoms as the president has focused on striking the nuclear accord with world powers to end the international sanctions that have crippled Iran’s economy with no guarantees the financial windfalls would benefit the consumer economy. Reuters found significant irony among young Iranians that Rouhani’s promises to loosen Internet restrictions have not been met. Access to social media remains officially blocked, though Rouhani and Khamenei have their own Twitter accounts. This has been a particular grievance among those under 30, who represent more than two-thirds of the 78 million people living in Iran and were born after the 1979 Islamic revolution. “I am not going to vote. What is the use of voting? My hopes are shattered,” said a 27-year-old engineer in Tehran, who refused to give his name. The situation for Iranian women remains abysmal and shows no signs of improvement after parliamentary elections. Under regime law, men can divorce their spouses far more easily than women, while custody of children over seven automatically goes to the father. Women have to get permission from their husbands to travel abroad. They are obliged to cover their hair and the shape of their bodies, their testimony as a legal witness is worth half that of a man’s and daughters inherit half of what sons do. A report by the U.N. special rapporteur on Iran last year said human rights in the country “remained dire” under Rouhani, while separately a U.N. child rights watchdog said this month that girls faced discriminatory treatment “in family relations, criminal justice system, property rights”. Support for that nuclear deal may also appear to be cracking based on a new poll conducted by the University of Maryland’s Center for International and Security Studies in January. Another question asked whether the deal was a victory for Iran or a defeat for Iran. In August, 36.6 percent of Iranians said it was a victory, but that number has now dropped to 27.4 percent. Interestingly, the numbers of Iranians who felt it was a defeat also dropped. Instead, a third answer – that the deal is beneficial for both Iran and the world powers that agreed to it – gained adherents, rising 43 percent of Iranians to 54 percent between August and January. Both are significant erosions of confidence by the Iranian people in what they believe from the Mullah’s regime and the fact they do not see any of the alleged benefits touted by the mullahs flowing to them and are unlikely to see any as the regime focuses on business deals benefitting industries controlled by the Revolutionary Guards Corps. That focus on benefits for the ruling elites was highlighted by criticisms voiced by regime publications affiliated with the IRGC which criticized a number of the contracts signed by Rouhani on his recent European tour in an effort to justify the removal of almost 90 percent of candidates from election ballots who might be viewed as moderates or even outright dissenters from being able to run for office. That militant and aggressive behavior was reinforced by comments made by the head of the regime army in the Fars news agency in he promised the regime would continue development of its ballistic missile program even though the international community has widely condemned it as a violation of existing sanctions, according to Reuters. In October, Iran violated a United Nations ban by testing a precision-guided ballistic missile, prompting a U.S. threat to impose more sanctions. In December, Rouhani ordered Iran’s missile program to be expanded. “Iran’s missile capability and its missile program will become stronger. We do not pay attention and do not implement resolutions against Iran, and this is not a violation of the nuclear deal,” Fars quoted commander-in-chief Ataollah Salehi as saying. He was referring to Iran’s deal with world powers last year to curb a nuclear program that the West feared, despite Tehran’s denials, was aimed at acquiring atomic weapons. But even as the Iranian regime was making these threatening statements, its foreign minister Javad Zarif was demanding that the U.S. make clear a public pledge not to penalize any European banks engaging in trade with the regime, according to Reuters. Many foreign banks are cautious about resuming trade with Iran following January’s nuclear deal because they fear being caught up in ongoing U.S. sanctions. Washington still prevents U.S. nationals, banks and insurers from trading with Iran and also prohibits any trades with Iran in U.S. dollars from being processed via the U.S. financial system. This is a significant complication given the dollar’s role as the world’s main business currency. European banks are also cautious – with some, including Deutsche Bank, remembering past fines from U.S. regulators for breaking sanctions, Reuters said. European businesses should be wary of jumping too quickly back in bed with the regime given its aggressive actions and engagement in escalating conflicts in Syria, Iraq and Yemen, especially since the upcoming parliamentary elections will be just another act of political theater with no real benefit or relief for the Iranian people. 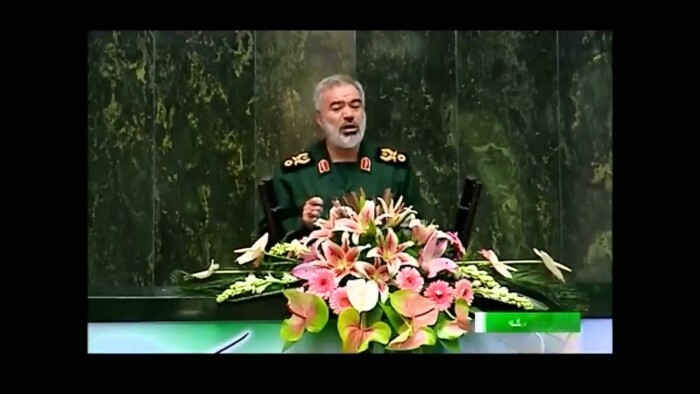 After awarding medals to Iranian navy commanders who had detained ten U.S. sailors, Sardar Fadavi, head of the regime’s Revolutionary Guards Corps Navy, addressed regime lawmakers about the incident, telling them his personnel had collected information from the sailors’ laptops and cell phones that had not yet been released, in addition to more footage. This information would be released if the United States ever sought to humiliate Iran, he said. “If U.S. officials say they are angry with and frustrated by the footage released, they would be 100 times more embarrassed if the IRGC releases other films of the capture, the Iranian commander said,” Tasnim, the regime-owned news agency reported. “Iran does not seek to humiliate any nation, he said, but stressed that if they want to humiliate Iran, the IRGC would publish the footage and make them even more embarrassed and humiliated,” it continued. One could argue successfully that these are not the comments of a government interested in smoothing over differences and becoming an engaged, moderate member of the community of nations, but rather a regime that still views the world in a hostile, militant way and intent on enforcing its superiority in any manner possible. But not everyone is buying the party line of the Iran lobby of Iran’s moderation and good intentions. The House of Representatives took up a new vote on legislation to prevent the Obama administration from lifting sanctions on Iranian entities unless it certifies they aren’t affiliated with terrorism or ballistic missile development technically already passed in the House last month, but a revote occurred on Tuesday to allow the full House to vote. The Obama administration predictably issued a veto threat of the Iran legislation and warned it would hinder its ability to implement the nuclear accord. “By preventing the United States from fulfilling its JCPOA commitments, H.R. 3662 could result in the collapse of a comprehensive diplomatic arrangement that peacefully and verifiably prevents Iran from acquiring a nuclear weapon,” the White House said in a Statement of Administration Policy. Paradoxically though, the administration had previously imposed new sanctions on the regime for the test launching of illegal nuclear-capable ballistic missiles. If you confused by now, you’re not the only one. The Senate Foreign Relations Committee also is taking fresh aim at Tehran with stepped-up sanctions to punish the regime for aggressive non-nuclear activities. Chairman Bob Corker (R-Tenn.) and at least one other senator are crafting new measures to address everything from Iran’s recent ballistic missile tests to the country’s human rights violations to a reauthorization of the soon-expiring Iran Sanctions Act (ISA). The measures, which are likely to come up in February, will be Congress’ latest attempts to ensure President Obama punishes mullahs in Tehran for bad behavior in the wake of the now-implemented nuclear deal. “We are looking at ways of having a much stronger pushback on the violations that took place,” Corker said of his proposed sanctions aimed at Iran’s recent ballistic missile tests. The ballistic missile measure is part of a trio Corker is readying, along with a reauthorization of ISA — a sweeping, longstanding law to curb Iran’s nuclear and missile activities as well as its support for terrorism through sanctions on the trade, energy, defense and banking sectors. Corker is also crafting a third measure, but declined to identify its content. Sen. Bob Menendez (D-N.J.) is also planning a package of “actions that we should be considering against Iran outside the nuclear portfolio.” Menendez has already co-authored, along with Sen. Mark Kirk (R-Ill.), legislation to extend ISA past 2016, and wants to step up sanctions against Tehran for its ballistic missile tests and human rights violations. Their actions mark the first significant move by lawmakers against Iranian regime since the pact took effect as they seek to keep Tehran on a tight leash. It remains to be seen how the congressional pushback will be greeted by the White House. The move by Congress are being motivated in part by the clear signals being sent by the Iranian regime in advance of parliamentary elections with the selective removal of any potential dissidents among candidates and to deliver a slate that is ideologically pure. The upcoming elections then are just a formality for the ruling mullahs to legitimize their rule in their eyes and provide the illusion of democracy as they reap the financial rewards of the lifting of economic sanctions. Ultimately the Iran lobby, led by the National Iranian American Council chooses to ignore these facts and instead continuing carrying the water for the mullahs. 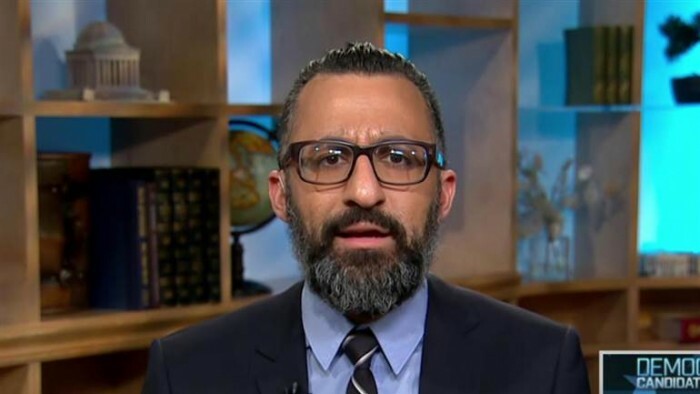 The Iran lobby’s leading cheerleaders seem to have a problem with selective memory recall as evidenced by the latest editorial by Reza Marashi from the National Iranian American Council in the National Interest in which he praised Hassan Rouhani’s European tour and boasted of the Iranian regime’s plans for its newfound wealth as a result of the nuclear deal. “Iran is pursuing this agenda in an effort to increase government legitimacy and security among Iranian society through improved economic conditions,” Marashi says in of the more inane comments he makes. “Alliances and enmities shift regularly in Iranian politics, but survival of the system is the shared goal of all stakeholders. Thus far, Rouhani’s political coalition has won Iran’s internal political debate by arguing that survival is better guaranteed through flexibility than intransigence,” he adds in typical think tank-speak. What Marashi is missing from his less than eloquent dissertation is the reality that is going on within Iran now which is the swift action by the Guardian Council to remove from parliamentary election ballots upwards of 90 percent of all candidates perceived to be moderate or opposed to the current mullah leadership. Even the grandson of the regime’s founder, Ruhollah Khomeini, was tossed off the ballot for being too moderate! Marashi’s piece is titled “Can Iran Get Out of Its Own Way?” That much he got right, since it is clear the mullahs in Tehran have absolutely no desire to halt their steady stream of militant and aggressive actions in solidifying their hold on power, continue their crackdown on human rights and internal dissent and utilize its newfound wealth to rebuild its infrastructure and enrich themselves at the same time. The upcoming parliamentary elections are now set to deliver a hand-picked slate of loyalists beholden to the mullahs and Ali Khamenei and Rouhani – far from being the moderate struggling to preserve the future of democracy in Iran – has ably served in his capacity as the puppet face for Khamenei. It’s also worth noting that Marashi’s claim of the regime realigning to provide an economic boon to ordinary Iranians is also a farce since the deals being signed are lined up to funnel billions back into the coffers of the Revolutionary Guard which controls the heavy industries such as petroleum, aviation and manufacturing. Marashi also doesn’t address the unseen corruption so deeply rooted in the regime economy that any foreign investor is likely to face barriers. He also does not dare mention the sophisticated cyberwall cutting Iran off from the rest of the world and the high degree of surveillance conducted by the regime’s intelligence agencies that monitor virtually all traffic in and out of the country and often leads them to dissidents and other activists. Despite the deals and the desire of European governments to begin trading with Iran, financing remains a big issue as major European banks remain reluctant to handle Iranian payments, deterred by previous huge fines from the US treasury. Nuclear-related sanctions have been lifted but other US measures relating to terrorism and human rights are still in place, according to The Guardian. In typical regime fashion indicative of the corruption within it, far from being a political fight between “hard line” and “moderate” factions, the fight within the regime can be viewed as a fight over the spoils of getting the nuclear deal since the vast majorities of Iranian industries are controlled in whole or part through shell companies belonging to the Revolutionary Guard, which in turn has provided a steady source of illicit income to regime officials for the past two decades. Even as Khamenei has still called for a “resistance economy,” his intent and those of the mullahs is not to resist any American threat, but instead keep the Iranian people under the boot of oppression and not allow the full benefits of a reopened economy to flow to them. Evidence of this schism was shown as the regime cancelled plans for a conference set for London where new contracts for foreign oil companies to drill in Iran. Regime officials ostensibly claimed the cancellation was due to British visa requirements, but in fact political turmoil domestically was to blame as various regime groups jockeyed for their share of the corrupt spoils. Some oil officials are worried the contracts won’t be attractive enough to offset the majors’ reluctance to invest globally due to low oil prices. Others fear mounting criticism by hard-liners who say the deals would give too much away of the country’s natural wealth, according to the Wall Street Journal. The new deals have been criticized by the Basij, the paramilitary oppressive forces, formed to uphold the principles of the mullah’s rule. On Saturday, members of Basij’s student wing were arrested after protesting against the contracts, the semiofficial Tasnim news agency reported. Political crackdowns in Iran are so commonplace and for so many trivial acts, that some Iranians who have been repeatedly arrested have developed handbook to help those who might face arrest in the regime. One of the student activists jailed three times and tortured, believes there are steps activists in Iran can take to better protect themselves, both inside and outside prison walls. He belongs to a group of over a dozen activists who used their hard-earned personal experiences to create a 19-chapter booklet in Farsi and English titled “Safe Activism: Reducing the Risks and Impact of Arrest,” according to the Guardian. Designed to teach activists and journalists how to avoid careless behaviors that could endanger them and those around them, the booklet, now online, also offers guidelines on what to do in case of arrest and how to mitigate the consequences of incarceration,” the Guardian added. Basic safety measures are highlighted in the first chapters of the ‘Safe Activism’ booklet. Readers are reminded to take precautions before meeting with other activists and not communicate important information over the phone. They are advised to keep sensitive documents as well as identification papers and travel documents at a safe place outside their residence, and to clear their homes of illegal items like drugs, alcohol and banned media. 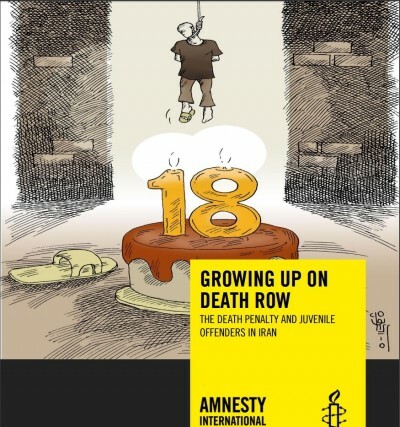 The fact that ordinary Iranians would need a handbook like these speaks volumes about conditions in Iran and is damning proof that Marashi’s optimistic views are really flights of fantasy. It would be more of a service if the NIAC published the handbook on its website so future Iranian-Americans visiting Iran are not imprisoned like so many others have been.